With Semilac Matt Lipsticks you can be sure of its permanency and beautiful matt colors! This new line of products from Semilac consists of 20 colors that correspond to those from Semilac's UV hybrids. Now you can finally make yourself perfectly matching make up! 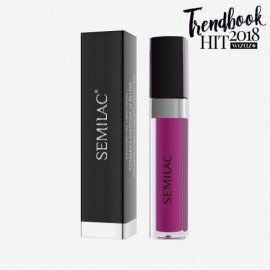 Matt Lip Fondant from Semilac - easy consistency for everyone. Matt colors are everything this season, that's why Semilac created their new line of matt lip fondants! Not only that, the fondants will match the colors of your nails if you choose to use Semilac's gel polish that have the same number coding as the fondant. The matt version of your lips will give your make up freshness and trendy look! Long lasting fondants? Only from Semilac! To make sure that your make up last for a long time remember to keep your lips moisturized! Use whatever you can to do, whether it's some special moisturizing cream or you can even use honey. Keeping your lips moisturized goes a long way in terms of longevity of your make up! MATT LIPSTICKS There are 20 products.